I NEED to read this eBook! Great clients won’t fall in your lap if you’re not promoting your business – agree? But promoting it means more than just sharing a few posts on Social Media, plopping a website together and writing a half-hearted blog. Using the right words can really make an impact on your conversions when you’re writing TO your ideal client and using known copywriting techniques to SPEAK to them. In this eBook, I’ll show you proven copywriting techniques for your VA business – emails, newsletters, blogs, websites and jobleads. These little tweaks could make a big difference to your client conversion rate. Purchase your copy now and start taking Monstar steps to improving your written communication (which is super important in the online world). Mon’s book has taught me more about copywriting than I ever knew existed and it’s a must-have for all VAs, new and old. You’ll find easy-to-implement steps and great examples of what and how to write to engage with clients/customers/businesses. Not only is this eBook packed with copywriting tips, but it has the true personality of the Monstar shining through – fun and down to earth. I downloaded Mon’s eBook to help me to write for not only my own business needs but also to better service my clients and their needs. I very rarely purchase ebooks but the moment I saw Mon had created such a great resource I just had to download it. And I’m so glad I did, Mon’s book was completely tailored to my needs as a VA and has completely transformed how I approach writing for my own business as well as my clients. Her book is full of Monstar gold! 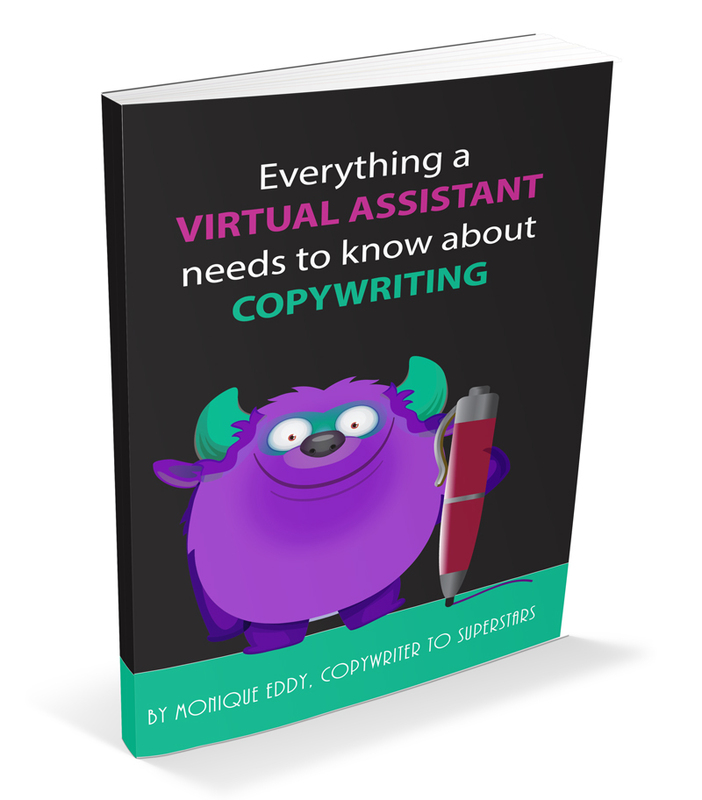 I loved Everything a Virtual Assistant needs to know about Copywriting. It’s really well written, easy to understand and implement into my business. There are so many great tips and tricks, I highly recommend grabbing it for your biz. Thanks Mon!